Tomorrow all 17 million plus players of Zynga's Facebook game FarmVille will be getting a new neighbor: The villainous star of DreamWorks Animation's Megamind, opening in theaters this Friday. DreamWorks Animation and Zynga team up for the first-ever feature film integration in the ridiculously popular Facebook game FarmVille. 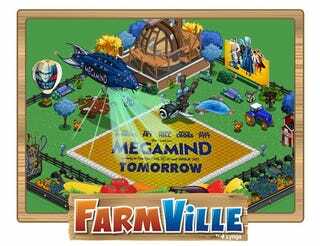 The self-described "incredibly handsome master of all villainy" will be neighboring all FarmVille players tomorrow, inviting them to come and visit his Mega-Farm, a unique construction filled with Megamind-branded buildings and contraptions. Players that visit the Mega-Farm will be able to score a decorative item for their own farm, along with a special Mega-Grow formula that allows them to instantly grow crops without wilting. "We're excited to bring one of the most highly anticipated films of the year to FarmVille and create a unique entertainment experience for FarmVille players worldwide," said Manny Anekal, Global Director of Brand Advertising at Zynga. "It's an innovative and fun way to connect Megamind and DreamWorks Animation fans through the world's most popular social game." Megamind, starring Will Ferrell, Tina Fey, Jonah Hill, David Cross and Brad Pitt, is a movie about what happens when a super-villain loses his superhero nemesis. It looks infinitely more entertaining than FarmVille, but only lasts 96 minutes.